Hops belong botanically to the nettle order of the hemp family. Only the female hops are required for the brewing process as these have the desired quality. 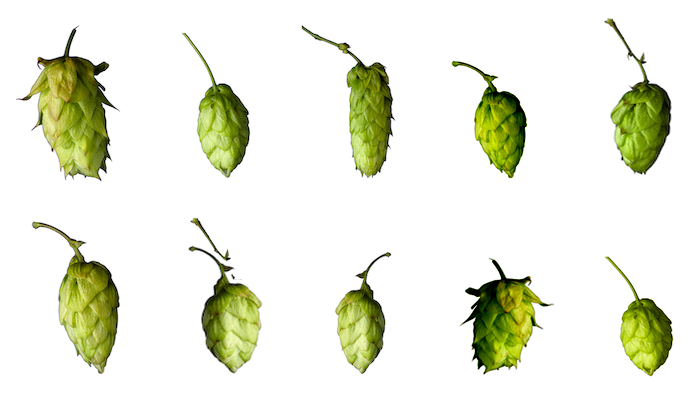 The male cones / plants are not suitable for brewing beer. They are however used for breeding i.e. cultivation. As well as the bitterness and aroma in the beer, hops are also responsible for the microbiological stability. Hops also account for a good head retention and improved stability of taste. In the recent past many breweries have rediscovered long forgotton – or newly cultivated – hop varieties to help them stand out from competitors and the so-called Craft beer was born. Hop resins (alpha and beta acids) as well as hop oils and polyphenols are of utmost importance for brewers. Low rainfall or too warm a climate can adversely affect the alpha acid values. The biggest dangers for the hops are pests (common spider mites, aphids, lovage weevils, grey caterpillars,….) and fungal infections (wilt, downy mildew, powdery mildew, botrytis blight). Hops are perennials, they remain in the ground for approx. 10 – 20 years and are harvested every year. This is made possible by cutting back the shoots. Using this method reduces the risk of disease and prepares the shoot for the coming harvest. 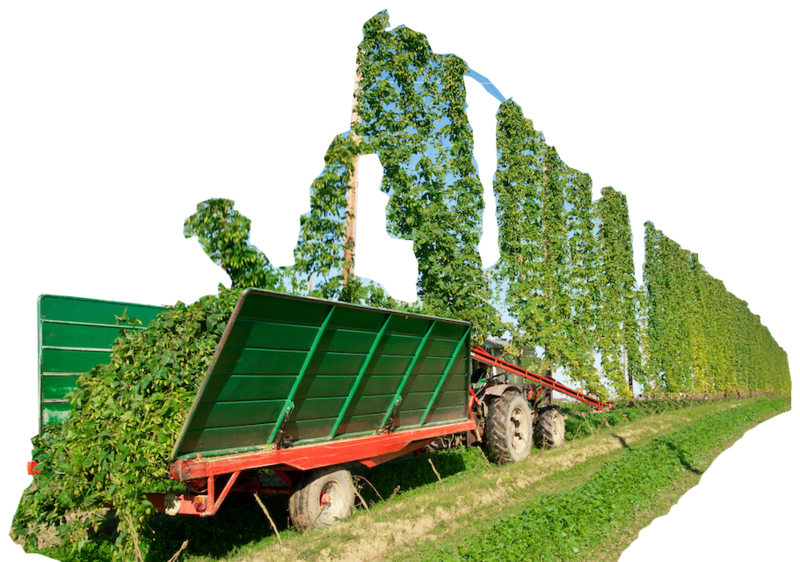 Loamy or sandy soil, which is not too compact and well-drained, is ideal for the cultivation of hops. Hops require a long period of natural daylight as well as a moderate climate and therefore are grown between the 35th and 55th latitude of the northern and southern hemisphere. Hop gardens are only cleared if the yield per hectare declines, the variety is no longer in demand or if the plants are diseased. Harvest time in the northern hemisphere (USA + Europe + Japan) lies within the time frame of August to October, in the southern hemisphere (South America, Australia, New Zealand) March + April. By adding aroma hops beer is given its characteristic smooth aroma and taste. The bittering hops regulate the basic bitterness of the beer with the initial hops addition. The bittering hops do not contribute to the aroma of the beer. By adding the so-called flavour hops the beer is given a fruity fragrance and taste in a completely natural way (and conforming to the German purity law). 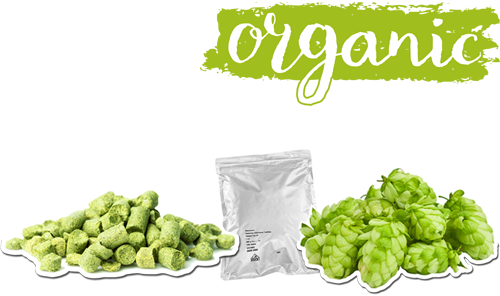 Before a traditional hop variety can be called “organic hops”, various specifications have to be met (specifications regarding cultivation, sprays, labelling …..). This special handling generates further cost-push process steps. 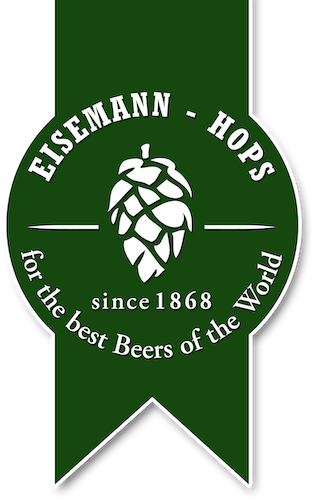 Monitored and well-known for the certifications of these hop varieties is the company A.B.CERT (based in Esslingen) with the Bioland (Germany) or USDA (USA) certification. The raw hops are sieved and cleaned of coarse impurities, then dried out to a humidity of approx. 8 – 10%. They are then pressed into 5 kg rectangular blocks and vacuum-packed in aluminium compound foil. The raw hops are sieved and cleaned of coarse impurities, then dried out to a humidity of approx. 8 – 10%. Then the raw hops are ground down into powder. The powder is pressed through a matrix – and the pellets are formed. In the next production step they are packed in aluminium compound foil with the addition of a CO2/N2-gas mixture. This is to make sure that no quality-damaging oxygen is in the foil. From 100 kg of raw hops approx. 90 kg pellets are made, hence the term „P90“. With the manufacture of P45 the first production steps are identical with P90. The extracted powder is however then sieved over belts at a temperature of -35 °C. During this process the lupulin glands lose their stickiness.  The lupulin separates from the spent hop cones. In this way an mechanical enrichment of the alpha acid content takes place. 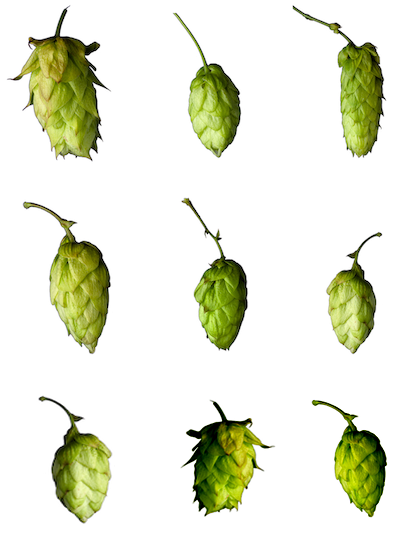 The alpha acid content can be adjusted according to the wishes of the customer by adding the hop cones later on e.g to 10,0 %. The pelletising and packing is the same as with the P90. Pellets weighing 45 kg can be extracted from approx. 100 kg raw hops – The pellets are called „P45“. 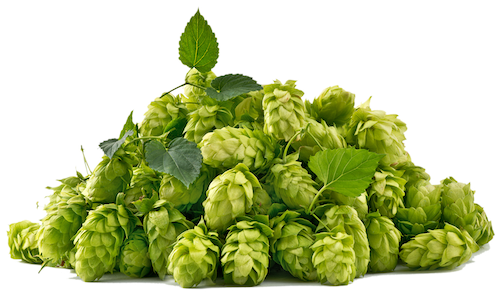 Solely α-acids, β-acids, essential oils and other soft resin componets of hops were extracted from the raw hops using CO2 (carbon dioxide). The determination of the α-acids are carried out with the analysis method EBC 7.7. HPLC. The processing costs are higher than those of the ethanol pure resin extract. An additional production step is required to extract the Xanthohumol from the spent hop cones which are used to extract the CO2pure resin. Generally CO2 extracts are preferred abroad. 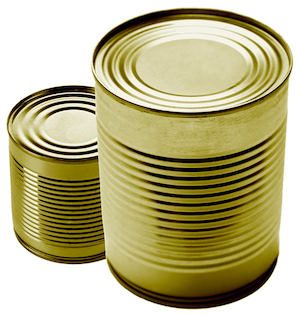 As well as the alpha acids, iso-α-acids, β-acids, chlorophyll and other pigments were extracted. Determination of the bitterness by means of the conductivity of bitterness measurement, analysis method EBC 7.6. + ½ EBC 7.8.HPLC. As more bitter substances are determined with the conductivity of bitterness measurement, the yield with ethanol pure resin extract is higher than the CO2pure resin extract. Relevant for large breweries is the fact that the ethanol pure resin extract requires a lower temperature (less energy required) than the CO2pure resin extract in order to be suitable for pumping. Xanthohumol, which is found in ethanol pure resin extract, possesses anticarcinogenic properties. There is no difference in taste to the CO2 pure resin extract. Is it possible to store the hops at home? Basically, yes. The vacuumed hops should be stored cool in an odorless refrigerator. It is also possible to freeze the hops at least below 10°C. 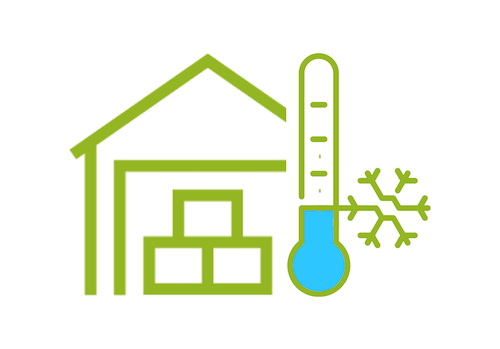 The optimum storage temperature is between 1 and 4 °C.If you have already opened the hops, use them immediately or in the next few days. Attention: Only closed and undestroyed foils can be stored for several years. If you have bought hops from us, we offer you the opportunity to have the goods stored for a small fee in our cold storage. The stocks can be requested at any time.